The Merle Lawson Memorial Salmon Derby was held yesterday in some pretty rough water. 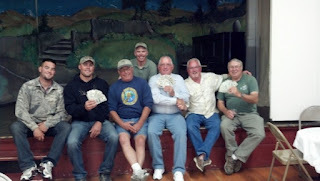 The winners were: Jake Showaker, 1st place, 24 pounds; Roger Remington, 2nd place, 24 pounds; and Rich Chapin, 3rd place, 23.5 pounds. Tied weights went to the first fish weighed in, so Jake's early finish put him on top. About 25 boats fished in unpleasant conditions at best, with some of the boats scooping waves over their bows while trolling. Hooking a fish was difficult and actually putting one in the boat without going in the drink yourself was a major challenge. Due to the skill of the competitors (and a bit of luck) nobody got hurt and quite a few fish made it into the boats. There was a raffle at the dinner afterwards with prizes donated by Diekmann's General Store, Dillon Beach Resort, Outdoor Pro Shop, Roseberry Construction, and the Lawson family. Thanks to everyone that came out, and hopefully we can do it again next year.